Last September, Jaime Miller released a series of articles on ELTjam on how to getting started as an online ESL teacher. The articles stirred up lots of great feedback; so in this post, I’d like to follow on from where Jaime’s articles left off: Now that I’ve started to teach online – how do I grow my business? Sounds great doesn’t it? But there’s a catch! To become a full-time online ESL teacher, you’re going to need a lot of students. Exactly how many depends on how much you charge per lesson, and for how many hours per week your students take lessons with you. At Off2Class, we’ve long advocated that teachers price their online teaching services at a living wage. Regardless, even if you can command pricing at the higher end of the spectrum – let’s say $30 an hour – you’re going to need 20-30 students to sustain yourself on a full-time basis. If you’re currently tutoring only a handful of students, that means growth! (A) How many students can I get to try me out as a teacher? (B) Of those students, how many will convert to becoming long-term clients? In my work at Off2Class I’ve had the pleasure of meeting with hundreds of ESL Teachers looking to make the jump into online teaching. Almost every online teacher (or aspiring online teacher) I’ve met with asks me about how they can improve (A) (i.e. find students) yet doesn’t mention (B) (i.e. how are they are going to convert prospective students into long-term customers). Interestingly, as a teacher, you have much more control over (B) than you do over (A) and both are equally important to growth. There’s no simple solution to finding new prospective online students (it’s a crowded marketplace with lots of competition) but when you do find a prospective student who wants to trial your services, it’s completely within your control to sell yourself as the right choice for the student. Sell yourself based on what you can do differently! I would like to suggest some strategies on selling yourself as the right choice to prospective ESL students. How do you differentiate yourself from the myriad of other options available to students looking to advance their English proficiency? How do you stand out in the crowded field of physical ESL schools, online language schools, tutor marketplaces and other independent ESL teachers? A nice way to think about differentiation is to consider your competitive advantage. What competitive advantages do you have as an online ESL teacher over a language school, an English Meetup, a conversation club, or a university course? Your key competitive advantage is personalization. 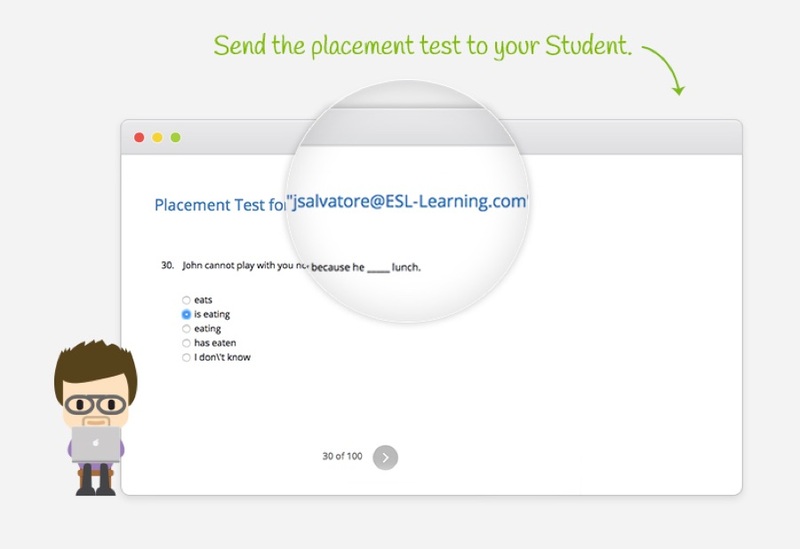 As an online ESL teacher you’re able to personalize the learning experiences of each student. I suggest personalizing a student’s learning experience from your first email communication or phone call and onwards. Use your first session with a student to convey that their ESL learning experience with you will be tailored directly to meet their needs. This is your competitive advantage as an independent ESL teacher. 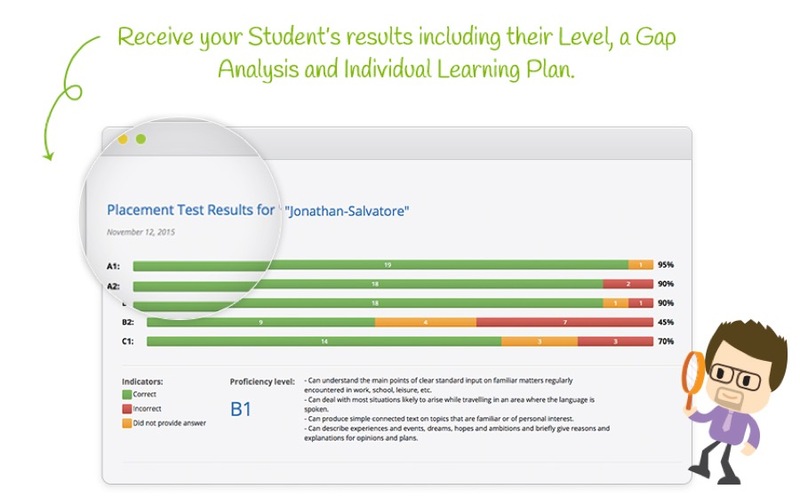 You can individualize the learning experience for each of your students. This isn’t an option available to language schools and you should take full advantage of it. Tailor the Learning Experience From the Start! Recently, Off2Class released an ESL Placement Test. The original goal of the free placement test was to provide teachers with a way to set a level diagnostic for students. The intention was not to use it as a tool for prospective students. However, I’ve noticed an interesting strategy emerge. Many of our teachers like to send the placement test to prospective students before their first sessions together. After their students complete the test, we produce their Gap Analysis (which outlines their ESL weaknesses) and an Individual Learning Plan (which outlines the lessons required to address those weaknesses). These analyses form a great tool to sell a unique learning experience to prospective ESL students and convert them into long-term clients. In your first session together, you can walk your students through the personalized plan you’ve crafted to address their unique language weaknesses and goals. The other practical feature of the placement test is that you can send it to prospective students with a couple of clicks. This helps with an element of growth that I haven’t yet discussed. No matter how well you personalize your approach with prospective ESL students, you will never convert 100% of your leads! You need to find scalable (i.e. easily-repeatable) ways of selling yourself to prospective ESL students. And of course, as an independent ESL teacher, it is also critical to determine whether a student is serious about taking lessons with you before investing too much time into teaching them (especially if you offer free trial lessons). If your prospective students aren’t willing to sit a grammar diagnostic, then it could be likely that they aren’t too serious about learning with you! Developing your strategy to convert prospective ESL students into long-term customers is a deeply personal experience. It will be different for every teacher. I hope that I’ve provided you with a framework to think about growing your business and using your competitive advantage to sell unique learning experiences to students! For any teachers testing the waters with online lessons, my biggest piece of advice is that customer service, personalization and quality will go a long way in growing your business. Spend less time on things like building your blog and Twitter presence and more on making sure your prospective students experience quality on their interactions with you. The latter is both easier to get right and is more important to growing your online ESL business! If you’re interested in using our free ESL placement test with your own students (or prospective students), check it out here. It’s free to use and so far the feedback has been very positive. Kris Jagasia is a co-founder at Off2Class. He is primarily responsible for customer service and user experience design, and in this role he gets to work with hundreds of independent online ESL teachers, all over the world. You can reach him by leaving a comment here or by email. Well designed support service for online teaching. Congratulations! Cheers, hope you get to use some the strategy with your own prospective students!